Donald Trump holds $8.8 billion in global health aid hostage under expanded "gag rule." 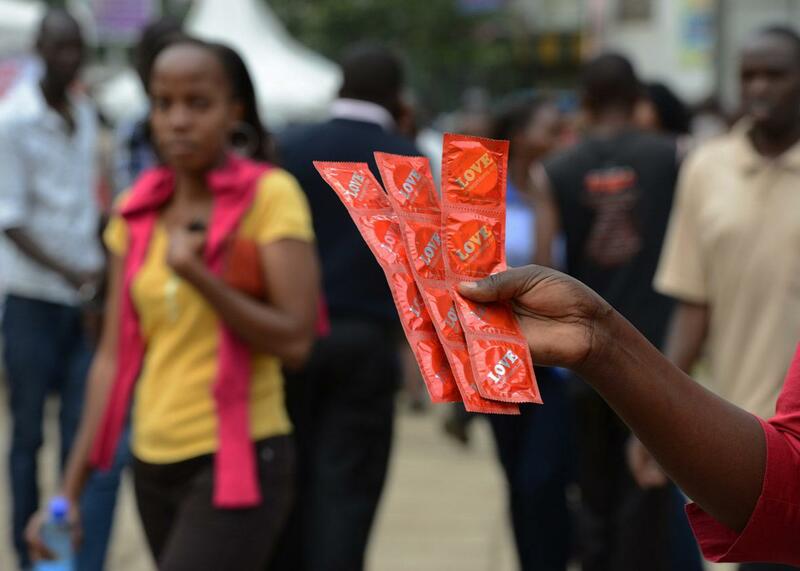 An AIDS Healthcare Foundation-Kenya worker distributes condoms in the streets of Nairobi in 2014. The Trump administration launched an unprecedented assault on global health on Monday, when State Department officials announced the details of the president’s expanded version of the so-called “global gag rule.” Other Republican presidents have previously instated the rule, also called the Mexico City Policy, which blocks U.S. funding from foreign organizations that provide abortion care, information about abortions, or advocate for abortion legalization. But previous iterations of the rule have only applied to the roughly $600 million the U.S. sets aside for family-planning assistance. Donald Trump’s version will apply to all global health aid—about $8.8 billion. Now, all overseas nonprofits must accept as a condition of any U.S. assistance that they cannot so much as tell a woman that abortion is a legal option. According to the State Department, the expanded gag rule will apply to funds earmarked for HIV/AIDS prevention, malaria treatment, maternal health programs, Zika response, and child health programs in addition to funds for reproductive health and family planning programs. Trump has renamed the policy “Protecting Life in Global Health Assistance,” or PLGHA, the sound you’ll make when you consider the cruelty written into its provisions. The U.S. currently gives health aid to organizations that experts at each funding agency have deemed the most capable and effective actors in global health. Some of those organizations, like Marie Stopes International and the International Planned Parenthood Federation, provide abortion care in addition to contraceptive services and other reproductive health care. Others don’t perform abortions but do give referrals or advocate for legal abortion, as they would for any policy that empowers women, communities, and economies. Under Trump’s floundering, incompetent administration, USAID, the State Department, and the Department of Defense will have to find new avenues for millions of dollars for which IPPF and Marie Stopes, among other organizations, will no longer be eligible. The U.S. is the largest government provider of global health aid in the world; in 2006, it delivered more than one-third of all donor support for the whole planet’s contraceptive supplies. After George W. Bush reinstated the global gag rule in 2001, NGOs in countries like Kenya and Ghana were forced to slash contraceptive distribution programs that served the neediest rural communities. Sixteen developing countries in Africa, the Middle East, and Asia lost access to their entire USAID-funded supply stream of contraceptives because it went through IPPF, which had well-established distribution networks all over those countries. Millions of women went without contraception they wanted and, in many cases, had already been using. Rates of unintended pregnancy rose in some of the world’s poorest populations. So did abortion rates, as they usually do when women have no way to prevent pregnancy. After losing their millions of dollars in USAID-funded contraceptives, four of those 16 countries ended up getting access to USAID-funded condoms—a less effective contraceptive than other more popular options, but better than nothing—through an HIV/AIDS prevention program Bush had specifically exempted from the gag rule. Under Trump’s rule, countries like these won’t get any contraceptives at all. Effective health-care providers recognize that people are not one-issue organisms: HIV prevention affects nutrition, nutrition affects child health, child health affects family planning, family planning affects Zika prevention, and so on. It’s close to impossible to disentangle reproductive health care and family planning work from the other vital services patients need. This is a good thing for patients, who are more likely these days to get care from organizations that serve a wider variety of their needs. But, perversely, this better approach to health care will amplify the damage the global gag rule can wreak. If a health clinic closes because the U.S. pulls funding due to its reproductive health work, people who depended on that clinic for all kinds of services will have nowhere to go. That’s “protecting life” under Donald J. Trump.